Today’s competitive environment, pricing pressures, and changing market dynamics are forcing insurance carriers to move towards a more dramatic approach, shifting away from out-of-date manual systems. Carriers are contemplating the replacement of their entire suite of applications that they have been using for their businesses. This transition highlights the progress of insurers toward modern Policy Administration Systems that allow carriers to realize efficiencies, gain flexibility, and organize their data for business analytics—automating the entire policy administration process throughout the risk lifecycle. An advanced policy administration system enables inter-departmental collaboration to support various processes such as policy issuance, risk assessment, documentation, accounting, tax and regulatory compliance, settlement, and reconciliation within the insurance sector. Reducing the manual and paper work, the system is highly capable of processing voluminous customer-records with speed and accuracy, saving time and money for the insurer. Insurance carriers can now not only retain a profitable customer base with the access to right information instantaneously, but also gain the confidence of new high value customers. However, implementing the policy administration software is usually saddled with various difficulties involving high costs, change management, long durations, and data quality. With the growing demand for comprehensive policy administration software, vendors are offering solutions that counter these pitfalls. 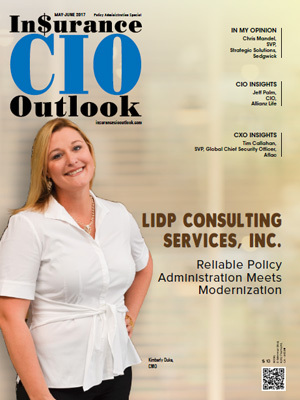 To help CIOs and CFOs find the right insurance policy administration solution provider for their enterprise, a team of prominent CEOs, CIOs, and VCs along with Insurance CIO Outlook’s editorial board has evaluated the best players in the space. The companies featured here demonstrate an ability to develop innovative technologies combined with outstanding customer service and talent base. In our selection, we looked at the vendor’s capability to fulfill the burning need for cost-effective and flexible policy administration solutions that will add value to the insurance landscape. 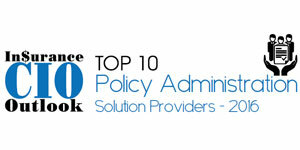 We present to you the Top 10 Policy Administration Solution Providers 2017.